Search is no longer simply about finding documents and web pages using the query box. It represents a powerful set of tools that can be configured to scan data and content and bring back results in customised applications that solve business problems. In this workshop, you will learn how to identify business problems that can be addressed using search. Then you will go through a process of designing the app, right from framing the problem to sketching the interfaces to measuring the desired outcomes. You will work with real business problems faced in your organisation, you will learn a methodology for addressing these problems using the capabilities of search, you will gain confidence in solving data-rich business problems. You will leave this workshop with a solid frame of reference to identify and solve data-rich business problems. Maish Nichani is Director at PebbleRoad, a UX consultancy based in Singapore, and at OlaSearch, a unique company that builds customised search interfaces to content collections. He has been an active member of the design community since 2000, having spoken at international conferences, held workshops, written articles and even contributed two books on design. 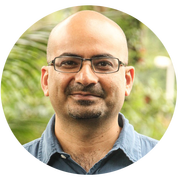 Maish is Vice President of the International Society for Knowledge Organization Singapore Chapter and co-founder of the "Innovations in Knowledge Organisation" Conference. This is a highly interactive workshop and limited places are available. Friday 26 January 2018, 1.30pm-5.00pm. Here are the workshop slides - download here.